Beets are huge in Polish cuisine. You can find them on the menu in almost every house, every week. We are never at a loss for new and unique ways to prepare them. One traditional way to prepare them is cooked, shredded and served with some onion, lemon and vegetable oil. Very simple. Other times Poles serve them shredded and braised in butter (which is super delicious too). Another popular dish is beet horseradish served with cold cuts, sausages and meats. This is a simple mixture of cooked, shredded beets with horseradish – I absolutely love it, especially around Easter time. And it doesn’t end there…clear borscht with mushroom dumplings and ukrainian borscht with cabbage, potatoes and beans, are both beet based soups that every Polish kid knows and loves. Whoever has tried working with beets knows how messy they are and if you don’t use gloves while handling, your hands may stay red for couple of days. This obviously doesn’t stop me from loving them. Some of these golden beets I’d chopped into very small pieces and packed for my son’s daycare lunch for the next day. Turns out they huge hit in the daycare. One of my son’s teacher told me that after work she’d gone driving for couple of hours in search of these elusive golden beets. Realizing my everyone’s love of these, my husband went back to our local market to get more but they were all gone. He spoke with the manager and it turned out that they were in huge demand – a golden beet frenzy. The manager then took my husband’s phone number to let us know when they are going to be back in the store. That’s what you call a good local grocery store! He not only called my husband when they were available, but also put some on the side for us, as they were disappearing at the speed of the lightning. I brought couple of these golden beets for my son’s teacher and she was jumping and kissing us like crazy; she couldn’t hide her happiness. Unbelievable, how those little cuties made someone so happy. 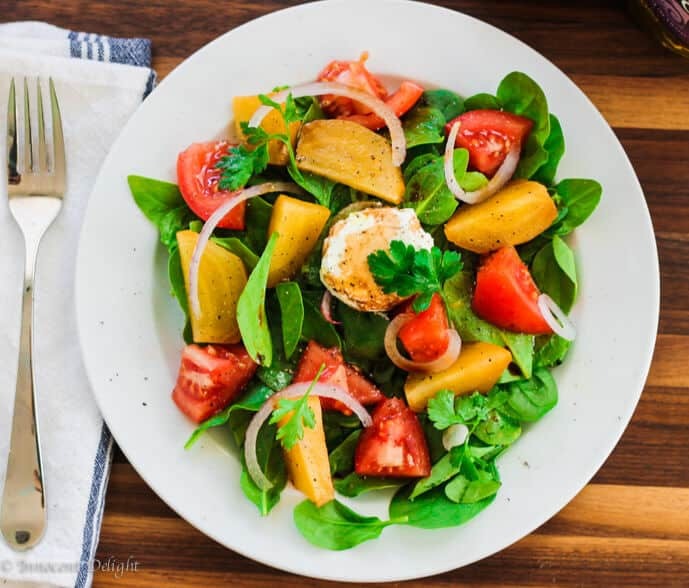 If you happen to love beets and find yourself in a situation where the golden ones are staring at you in a store, grab them and make this delicious and easy Golden Beets Salad with Goat Cheese for a healthy lunch. 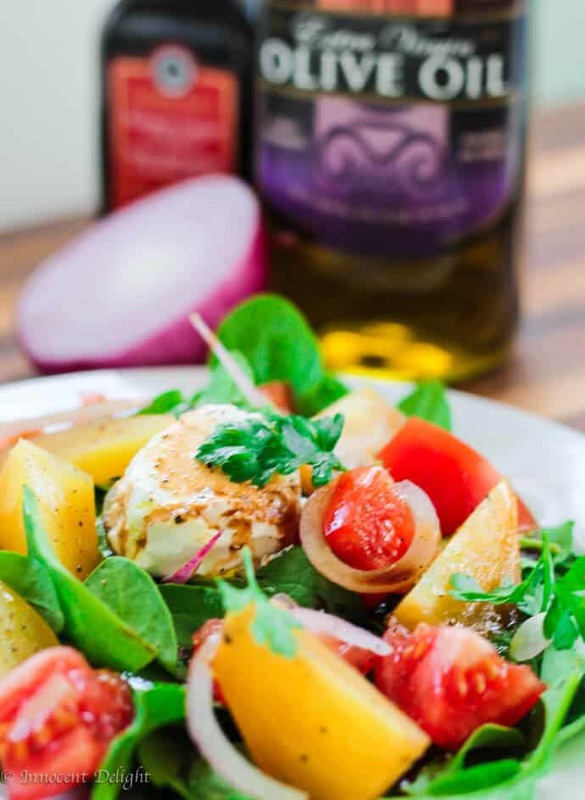 Mix together balsamic vinegar, olive oil, salt and pepper and pour over the salad. 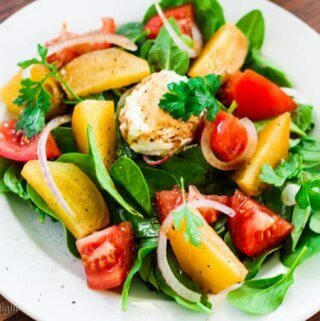 I love the golden beets and goat cheese salad! This looks delicious! 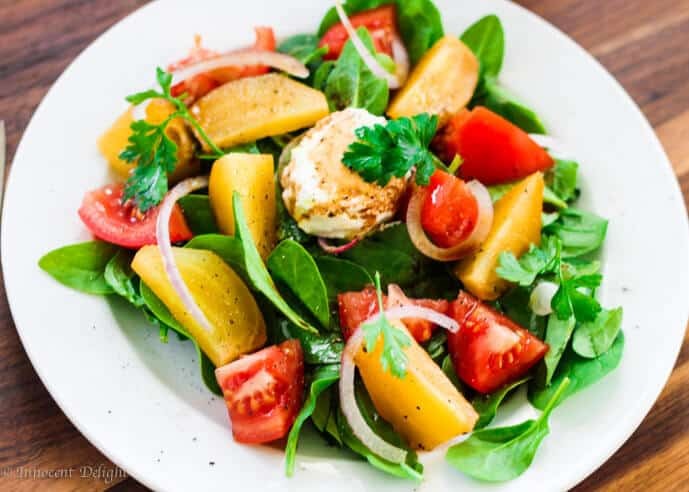 I have to find some golden beets so I can try this concoction. Thanks!